7 people died in Extra Judicial Killing in Bangladesh. By Bangladesh Media; 7 people were killed in Bangladesh by the Para military force Rapid Action Battalion (RAB). As usual Rapid Action Battalion demanded "they were criminal and died in a gun fight, where the criminals opened fire first against RAB and RAB returned fire back for self defense". 6 people were killed in Narsinghdi and 1 man in Dhaka district. In case of Narsinghdi RAB 11 and in Dhaka RAB 4 Battalion's involvement were confirmed by their press release. RAB-11 demanded that "at least six ,suspected muggers, were killed and two others injured in a 'gunfight' with Rapid Action Battalion (RAB) in Narsinghdi Sadar Upazila on Monday". In another press release RAB-4 claimed that "on a tip-off, they had waylaid on the street behind the Krishi Bank branch at Mirpur-13 where a criminal and his accomplices were preparing for committing crime." Contrary to RAB's demand, in both cases, eye witnesses and relatives demanded that there were no gun fight. referring to an eye witness the daily New Age reports that the deceased were trapped in Narsinghdi, it reports that "the RAB team had rushed to bridge-5 near Shalidha helipad, blocked the Narsingdi-Madanganj road and shot the people traveling in a micro bus." And relatives of the deceased in Dhaka demanded that the man was picked up earlier by the civil clothes law enforcers and later killed by the Rapid Action Battalion. Spot Norsinghdi: Six people, said to be snatchers, were killed in a ‘gunfight’ with RAB while they were trying to flee after snatching money from a businessman near the bus terminal in Narsingdi town Monday afternoon. Witnesses, however, alleged that RAB personnel had blocked Narsingdi-Madanganj road at Shalidha and shot dead six people and injured some others. The deceased were identified by the law enforcers as Anwar Hossain, 27, microbus driver Mosharraf Hossain, 26, Saidur Rahman, 30, of Madhabdi, Masud Afridi, 30, and Arif, and their ‘leader’ Jamal, 45, of Bholta. The deceased and the injured were residents of the district, the Narsingdi model police station officer-in- charge Asaduzzaman told the media. ‘The gunfight took place at around 2:30pm in an area adjacent to bridge number 5 in Narsingdi,’ the RAB-11 commanding officer, lieutenant colonel Abu Hena Mostafa told the media. The RAB-11 company commander, major Khandaker Golam Sarwar claimed that a gang of armed muggers numbering 20 had snatched Tk 40,000 from a businessman at Narsingdi bus stand. The snatchers were trying to flee to Araihazar by a microbus, he said. 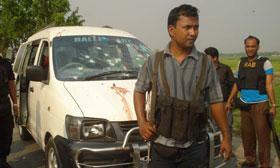 ‘After receiving a phone call, we pursued the micro bus forcing it to stop in Shalidha helipad area,’ he claimed. But the RAB officer did not give the identity of the businessman, saying ‘it would hamper investigation of the incident.’ The police also could not name the businessman. The RAB officer claimed that the businessman along with his nephew was scheduled to go to Dhaka by a bus. away, informed him of the incident on mobile phone. ‘Immediately, we put up a roadblock near bridge number 5,’ he said. He claimed that the ‘muggers’ had opened fire on the RAB personnel, injuring two battalion men, triggering a ‘gunfight’. After the encounter, three bodies were found on the ground while two in the micro bus and one on a truck the gang had hired for mugging, Sarwar claimed. Narsingdi police sent the bodies to the general hospital morgue for postmortem examinations. The injured snatchers, Amar Biswas, 36, of Raipura, Monir Omar, 25, of Panchdona, Shaon, 24, of BIshaldi and Masum, 28, of Shibpur, and two RAB personnel – Saiful Islam and Sohel– were admitted to the same hospital. 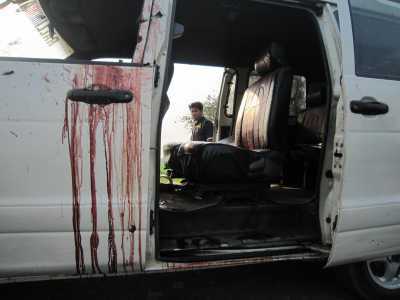 One witness, however, told New Age that the RAB team had rushed to bridge-5 near Shalidha helipad, blocked the Narsingdi-Madanganj road and shot the people traveling in a micro bus. Spot Dhaka: In Dhaka, a garment waste trader, who was picked up from in front of his rented house at Keraniganj on Sunday, was shot dead in another incident of ‘crossfire’ with the RAB in a narrow street in Mirpur area early Monday. RAB killed Abdul Momin, 24, who had rivalry with a local leader of Awami League over garment waste trade, alleged his widow Josna Akhter Poly. The Kafrul police, however, identified the deceased as Md Momin alias Lengra Momin, 32, of Brahmanbaria, and an accused in eight criminal cases for extortion, abduction and murder with Kafrul, Pallabi and Sher-e-Bangla Nagar police stations. Momin’s widow alleged that her husband had rivalry with Rubel, an Awami League leader at Mirpur. Rubel denied he had any contacts with Momin. The RAB-4 in a press release claimed that on a tip-off, they had waylaid on the street behind the Krishi Bank branch at Mirpur-13 where Momin and his accomplices were preparing for committing crime. Sensing their presence, the ‘miscreants’ opened fire on the RAB men, prompting a ‘gunfight’, the release claimed. The law enforcers found Momin lying on the ground with bullet wounds while his accomplices fled the scene. RAB claimed that the locals had identified the man as Momin but the locals said they were not allowed to see the man lying on the street. Dhaka Medical College Hospital sources said Momin was brought dead to the hospital. নিহত ট্রাকচালক মাসুদ আফ্রাদের বাবা গিয়াসউদ্দিন জানান, আট বছর ধরে তার ছেলে বালুর ট্রাক চালাচ্ছে। কোনো দিনই ছেলের নামে খারাপ কিছু শোনেননি। ছেলেকে গুলি করে হত্যা করার পর র‌্যাব বলছে, মাসুদ সন্ত্রাসী। গিয়াসের দাবি, তার ছেলে অপরাধী হলে তাকে গ্রেফতার করা হলো না কেন? তাকে কেন গুলি করে হত্যা করা হয়েছে? I am Bijoy Brahmo, Village-Kalshira, P.O-Barashia, P.S-Chitalmary, District- Bagerhat want to be a royal eye wetness against a death pennalty. Late. Vupal Brahma is my cousin and we are same tribe also was living as noghbour. He was killed by Underground Terrorist not by Shato Ranjon Barai. I have come to know Shato Ranjon Barai, S/O-Pulin Barai, Village-Ruyarkul, P.O-Barashia, P.S-Chitalmary, District-Bagerhat is going to be Death Pennalty under Section 302 but it is wrong. When Vupal Brahmo was killed & murdered that time Shato Ranjon Barai was in my House and with my another son Bidut Brahmo . He is not all connected and involved in that murder.